Potluck dinners can be a lot of fun, but they can also be a bit stressful for those who aren’t exactly sure what to bring. When you have a company potluck dinner coming up, you might worry that whatever you bring won’t be up to snuff. However, there are a ton of great recipes that can be found online that require little to no skill in the kitchen, and these recipes will both delight and impress anyone who tastes them. Below are five of the best dishes you can whip up for that next big potluck dinner at work. This recipe is both delicious and incredibly easy since it only requires browning some ground beef before throwing all the ingredients into a crock pot. This dish is found in many of the most popular lists of quick and tasty crock pot meals, and it takes very little prep time. The ingredients include the browned ground beef, two different types of beans, onions, peppers, tomatoes, garlic, beer, broth, spices, and a seasoning called liquid smoke. Once all that is settled in the crock pot, let it simmer for eight hours. The chili is best served topped with a handful of Fritos, a spoonful of sour cream, and a sprinkling of shredded cheddar cheese. 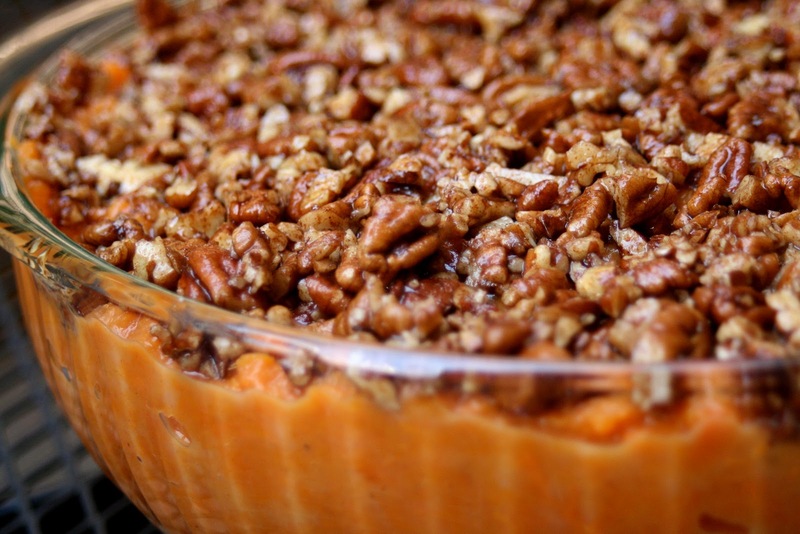 You might not consider trying to make a sweet potato casserole in a crock pot, but this recipe will show you what you’ve been missing. The recipe requires the sweet potatoes to be diced into small chunks and placed in the crock pot, and it also calls for two apples similarly diced. A half cup of water and a quarter cup of honey should be added as well, along with nutmeg, cinnamon, and a dash of salt. Once all the ingredients have been added, cook on high for about three hours. “After the potatoes and apples have softened, they can be mashed either with a wooden spoon or an electric mixer,” said ARISTA Catering. Before serving the casserole, stir in two tablespoons of butter and a half cup of milk, and top the casserole with pecans. This recipe is great for those who want to impress without having to use a crazy number of ingredients. It only requires a whole chicken, salt, pepper, and olive oil. To make this delicious chicken, simply heat your oven to 500 degrees with a cast iron skillet resting on the bottom rack. Apply the olive oil to the outside of the chicken, and be sure to cover the entire surface. Salt and pepper the bird liberally, then place the chicken breast-up into the skillet when the oven is ready. Allow the chicken to roast for about 15 minutes, then reduce the heat to 350 degrees. Let the chicken continue to roast until it turns a crisp golden brown and its internal temperature reads at least 155 on a meat thermometer. Let the chicken rest for about five minutes before carving. Who doesn’t love a crockpot full of meatballs at a potluck dinner? This recipe makes some of the best meatballs in the world with a bit of twang to them. The sauce is what makes these meatballs shine, so any raw frozen meatball works for the base. First, warm about a tablespoon of olive oil in a medium sauce pan, then add several gloves of diced garlic. Add a cup and a half of ketchup, a cup of honey, a half cup of soy sauce, two tablespoons of brown sugar, and one tablespoon of sriracha to the pan and stir. Simmer for about ten minutes, then add the sauce and meatballs to the crockpot and cook on low for two or three hours. This is sure to impress your coworkers, especially when they hear you made it from scratch. Start by peeling an orange and slicing about ten apples, then place them in a crockpot. Add three cinnamon sticks, two teaspoons of ground gloves, and some granulated sugar to taste. Cover the fruit with water and cook on low for about seven hours. Mash the fruit together to release the flavors, then drain the cider through a fine mesh sieve or cheesecloth to remove the solids. Serve warm or chilled.